Situated at the top of the Dragon Shrine, the Ancient Dragon is a demigod that has lived since the beginning of time. Undead seek the Ancient Dragon's guidance in hopes of breaking the Curse. It can communicate telepathically with the player. The Ancient Dragon stands magnificently, deep within the shrine on the eastern outskirts of Drangleic. The Ancient Dragon has watched over the world for aeons past. This powerful being stands and waits for whoever may visit him. The path to the Ancient Dragon is guarded by Drakekeepers. These eternal guardians of the Shrine are garbed in onyx armor, staunchly watching, ready to defend its resident or allow one worthy enough to be granted audience. A number of the Drakekeepers hold Greatshields of Glory. These shields were specifically commissioned for Syan, King Vendrick’s most loyal knight, and indicate the Drakekeepers were likely creations of Aldia and Vendrick. The terrible deeds carried out in Aldia led to the unintentional birth of several shadowy things, all of them eerily malformed and it is said that something dark indeed eats away at the Drakekeepers. The Shrine is also protected by the Dragon Knights. These warriors serve to protect the Ancient Dragon, and the Petrified Egg. These zealots sought everlasting life and are said to have conducted rites to imbue stones with the strength of dragons. The large petrified egg is surely their most precious object, for eggs are vessels that harbor life itself and symbolize the deepest secrets of existence. This Petrified Egg must contain the answers they seek, perhaps they are waiting for it to hatch? It is strongly suggested that the Ancient Dragon is a creation of Lord Aldia. The mysterious Lord Aldia secluded himself inside a manor to conduct various experiments. He attempted to uncover the secrets of life itself, and viewed the Undead as a key to this mystery. Those invited to the manor disappeared, replaced over time with malformed beasts that roamed its halls. Unspeakable deeds were performed and unnatural creatures created. Aldia kept Giants in his manor, and attempted to recreate a dragon, but after some time was not heard from again. His manor contains skulls of unidentified creatures, possibly those of dragons. The Enhanced Undead we encounter seem to be half-dragon, but with the mind of a Hollow. The Ancient Dragon drops a Petrified Dragon Bone and a Soul of a Giant. If the Ancient Dragon was a genuine creation it would never have the Soul of a Giant. From all of this it is clear that the Ancient Dragon is not genuine, it is a prop, a false deity created by ones who would cozen fate herself. The Ancient Dragon was created, and it is likely because dragons were seen as a possible cure to the Curse. King Vendrick condemned his own elder brother, Lord Aldia, to the mansion on the eastern outskirts of Drangleic. They both sought the truth, but through different means, and their fervour meant the eventual withering of their familial ties. If our human flesh is our greatest weakness, then those who seek a form that imitates the ancient dragons are the true vanguard. Touching an ancient dragon scale brings our own flesh closer to that of the eternal ancient dragon and gives one a glimpse into the Abyss. Believers in the Dragon will rise above this petty corporeal existence. If able to gain audience with the Ancient Dragon, it will give you the Ancient Mist Heart, a manifestation of ashen mist that allows one to delve into the memories of the withered. It does this by communicating telepathically with the Player. Why the dragon has a Soul of a Giant. 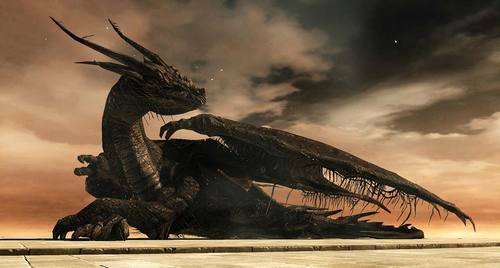 The real dragon was revived by Aldia in an attempt to study dragons to learn how to become immortal. The skeletal dragon in Aldia's Keep is an example of his earlier failure to revive a dragon in his research. Nashandra calls the dragon a "false deity", which indicates that the Ancient Dragon is not an original but a copy. 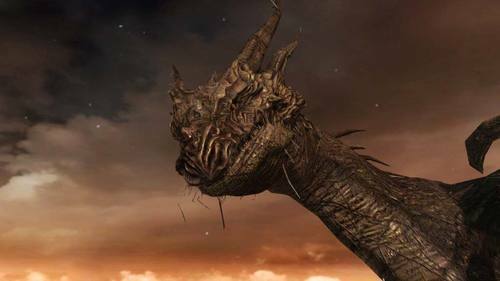 Only a Giant's soul could be powerful enough to sustain a dragon without a soul of his own, and that is what Aldia used to bring this dragon to life. "The murk shifts and stirs." "Yet another stands before us…"
"For the curse of life, is the curse of want." "Into the fog, in hope of answers." stands magnificently, deep within the shrine. for whoever may visit him. Reinforces equipment made from special souls. veracity of the name is questionable. Brave Undead, what did that dragon tell you? That thing is a prop, a false deity. Don't be fooled, my Undead.